This advent calendar review may seem a bit early, but there is a very good reason for that. All the best advent calendars sell out REALLY quick and this one is amazing value, so you don't want to miss out. 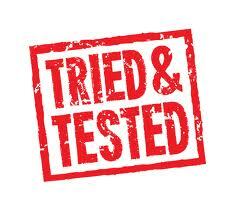 We were sent one to have a look at and I have to say, it is incredible value for money. The rise in non-food gift advent calendars has really taken off in the last couple of years and now you can buy all kinds of different types, in every kind of price range. This elegant offering from Wilko offers a wide selection of cosmetics, that are a small, but useable, size and contain something for everyone. 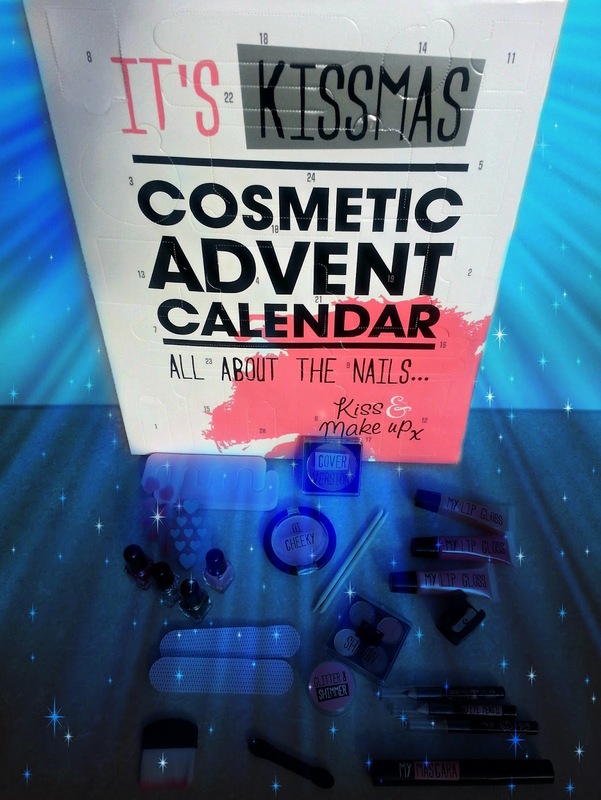 The best bit about this advent calendar is that because it is so varied in its contents, by December 24th, the lucky recipient will have an entire range to create a wealth of new make up looks for the new year. I will be revealing the full contents of the calendar below so, if you don't want to ruin the surprise, stop scrolling now please! The Wilko Kissmas Advent Calendar retails at an astonishingly low £5. 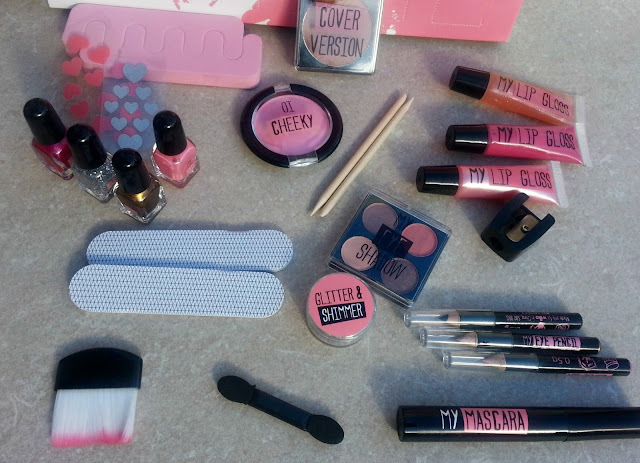 Yes, just £5 will get you, not just this entire collection of make up, but also the unbridled joy of receiving it in tantalising gift form for 24 days straight! 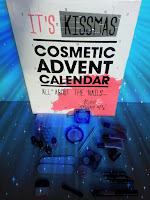 24 days of cosmetic-induced joy behind every door. Amazing. I know I'm bangng on a bit, but I can't believe what you get for your money. If you have children with a large age gap, like me, something like this can be invaluable to solve the fairness issue. There are lots of calendars available with little toys in, but there comes an age, where that isn't really appropriate, but you don't want to leave your older child out. So, if you have a girl, £5 is small price to pay to have two happy children. 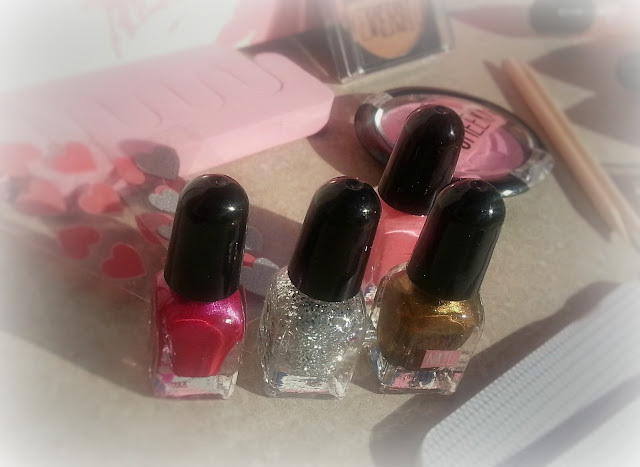 It's hard to pick a favourite item from the collection, but if I had to choose one, it would be the nail varnishes. They are so cute, and really useful for travelling. The colours are vibrant and different, but compliment each other, opening the door to any number of combinations of contrasting tips and stencilled patterns. This calendar offers fantastic value for money, I really can't stress that enough and has enough versatility to and choice to please even the most discerning adventee. This would make a great gift for a teenager, but would also be fun for adults who want to embrace the Christmas build up too! A Pertinent Point about Sexual Sell-By Dates! Why is Money Management not Taught in Schools?